It's summer, it's peach season and it's time to break out all those peachy recipes. My kids can't get enough peaches. They'll eat it anytime, anywhere. If I want them to try any other fruit, I just tell them it's like a peach and they gobble it up. So what better way to sneak in a veg, than with a Whole Grain Carrot Peach Muffin! This soft, tender muffin is packed with whole wheat, oats, carrots and peaches. Nothing gives me more anxiety than trying to think of something healthy to feed my kids. Mom guilt is real people. Every time we run low on time or money, and we reach for the fast food I get a pang of guilt. When I go out to eat and they don't get a full serving of vegetables. GUILT. When he has a scoop of ice cream or a cupcake. GUILT. I know this all stems from the high A1C issue I talked about in previous posts. But that year of testing has traumatized me. I feel guilty just allowing him to eat like a regular kid. Hamburgers, fries, ice cream- all normal, I know, but the guilt still creeps in... So to ease my fears I like to make my own baked goods to control the amount of sugar and carbs he eats. Hence, my many posts about muffins and breakfasts. Ok... enough of my mini mommy rant. On to the baking! As I mentioned before, muffins are the easiest and probably fastest baked good I make. When my kids were really little, I would come home from work and whip up a batch of muffins after they went to bed so that they had something fresh to eat in the morning. This muffin recipe grew out of my kid's love for peaches, and my weird desire to sneak a veg into their food when they're not looking. I figured both carrots and peaches are orange, so it's a perfect combo for mommy sneakiness! This recipe uses three types of flour. Oat, whole wheat white and all-purpose. Oat flour is just a matter of grinding rolled oats in a food processor till it's a fine powder. 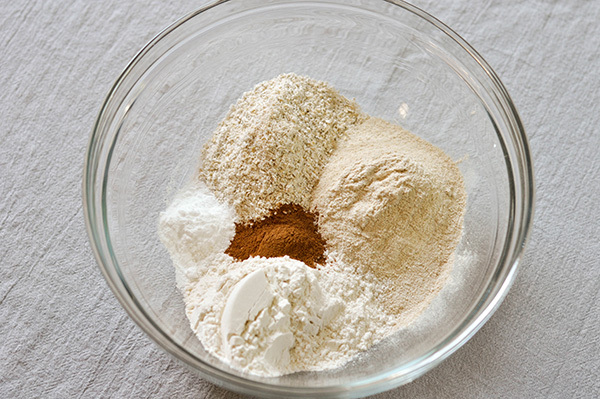 I add the all-purpose flour to add a tenderness to the muffins you just don't get with whole grain flours. It's a bit of cheating, but texture is half the battle when it comes to feeding little ones! I whisk all the flours plus baking powder, baking soda, and cinnamon together. Then in a separate mixing bow, I whisk together the sugar, oil, eggs and vanilla. Pour the wet mixture into the flour mixture and fold together with a rubber spatula until it just comes together. Then gently fold in the shredded carrots and diced peaches. Fill your lined muffin tins about two thirds full. For the topping I mixed together butter, oats, cinnamon, flour and dark brown sugar with my fingers until it became crumbly. Sprinkled this mixture on top of the batter and baked at 350F for 15 minutes or until an inserted toothpick came out clean. Enjoy this with some milk, coffee or tea for a healthy and summery breakfast treat. These should be stored in the fridge because the moisture from the fruit can lead to some science experimentation if left out on the counter overnight. Preheat the oven to 350F. Place muffin liners into the tins. Mix the topping ingredients together with a fork or your fingers until it looks crumbly. Set aside. Pour the oil mixture into the flour mixture. Fold until just combined. Gently fold in the carrot and peaches. Spoon batter into prepared muffin tins, about two thirds full. Sprinkle with oat topping and bake for 15 minutes or until an inserted toothpick comes out clean. Allow to cool in the pan for 5-10 minutes before moving to a wire rack to cool completely.